1.Knowledge: give instruction of doing something. 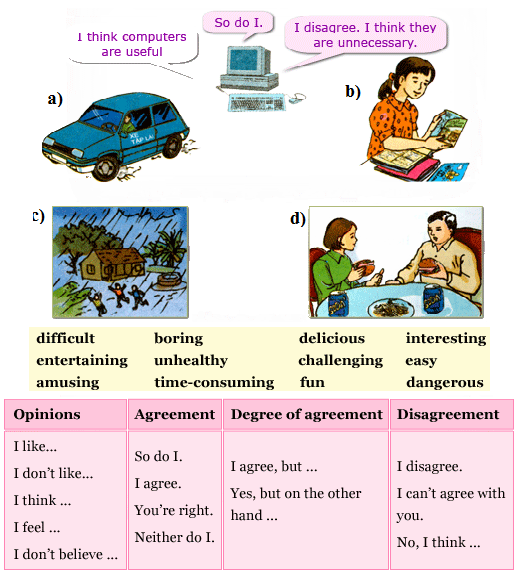 3.Attitude: enjoy learning and show their positive attitude in learning English. – Driving a car is easy. I disagree. I think it is very easy once you get used to it. – Learning to drive a car can be challenging. You’re right, it is difficult to get used to driving in traffic. – If you don’t learn to drive properly, a car can be dangerous. I agree. You can kill someone if you hit them with a car. – Comic books are boring. I don’t like them. Neither do I. I would rather read a mystery story. – Looking at the drawing in comic books can be fun. I agree, but not all the time. – Reading comic books is interesting. I can’t agree with you. I think they are too boring. – Walking in the rain is fun. I like walking in the rain, too. It feels so refreshing. – Rain makes the flowers grow. I agree. They look so pretty. – Foreign food is delicious. You’re right. Pizza is one of my favourite things to eat. – Hamburgers, soda and French fries are fun to eat. I think so, too. I love cheeseburgers and French fries. – This kind of food can be unhealthy. I agree, but if you don’t eat all the time, it won’t hurt you. Lan: Máy tính của mình có vấn đề. Lan: Nó không hoạt động được. Mình nghĩ nó hỏng rồi. Ba: Không. Bạn chưa cắm phích vào ổ cắm mà. Lan: Ồ mình xin lỗi nhé. Hoang: The monitor of my computer doesn’t work. Hoa: What’s the matter with it? Hoang: The screen is too dark. Hoa: No. You didn’t adjust the knob. Hoang: Oh, I’m so foolish. Phuong: I am having problems with my mouse. Mai: Oh. You should check the plug.